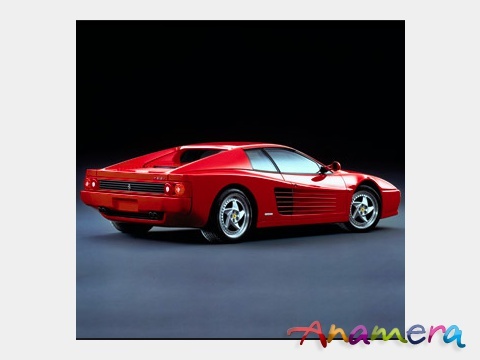 Upon its introduction in late 1984, the Testarossa stunned the world with its avant-garde styling. Long low and wide, the Testarossa appeared even more so thanks to the extensive use of horizontal slatting, a feature that would be replicated both on other Ferraris and on many other lesser cars. Yet beneath these striking features was a surprisingly organic and handsome form that remains as arresting today as it was twenty years ago. Motivated by a new four-valve version of Ferrari`s horizontally opposed twelve-cylinder engine that made 390hp, the car was quick and made fantastic noises, but was also very plush with leather almost everywhere, including on the rear shelf, headliner, and visors. The trunk is reasonably sized and the car very comfortable and easy to drive, making it an ideal way to cover long distances at high speeds in comfort. Many Testarossa owners use them regularly. The design came from Pininfarina. The design team at Pininfarina consisted of Ian Cameron, Guido Campoli, Diego Ottina and Emanuele Nicosia. With little surprise, they were led by design chief Leonardo Fioravanti, the designer of many contemporary Ferraris. The design was originated by Nicosia, but the guidance of Fioravanti was equally important. Being a trained aerodynamicist, Fioravanti applied his know-how to set the aerodynamic layout of the car. This meant the large side intakes were not only a statement of style but actually functional – they drew clean air to cool the side radiators and then went upward and left the car through the ventilation holes located at the engine lid and the tail. As a result, the Testarossa did not need a rear spoiler like Lamborghini’s Countach yet produced zero lift at its rear axle. The aerodynamic drag coefficient of 0.36 was also significantly better than the Lamborghini’s 0.42. Pininfarina’s body was a departure from the curvaceous boxer—one which caused some controversy. The side strakes sometimes referred to as “cheese graters”or “egg slicers,” that spanned from the doors to the rear fenders were needed for rules in several countries outlawing large openings on cars. The Testarossa had twin radiators in the back with the engine instead of a single radiator up-front. In conjunction the strakes provided cool air to the rear-mounted side radiators, thus keeping the engine from overheating. The strakes also made the Testarossa wider at the rear than in the front, thus increasing stability and handling. The F512 M was the last version of the Testarossa. Five hundred and one cars were produced in total, of which 75 were right-hand drive so ONLY 426 units were LHD. The F512 M was introduced at the 1994 Paris Auto Show. The car dropped the TR initials and added the M which in Italian stood for modificata, or translated to modified, and was the final version of the Testarossa, and continued its predecessor’s weight distribution improvement of 42% front: 58% rear. The F512 M was Ferrari’s last mid-engine 12-cylinder car, apart from the F50, Ferrari Enzo and LaFerrari, featuring the company’s last flat engine. The Testarossa was replaced in 1996 by the front-engined 550 Maranello coupé, which was already a totally different concept of Ferrari .In 1995, the F512 M retailed for $220,000. This particular car is one of the very desirable units of the so-called “modificata” or simply “M” born in red “rosso corsa” color with black interior. It comes with the most desirable and pricey optional factory bucket seats. It was delivered to Japan where the car spent most of its life. EU specs. The car comes with all its books, leather pouch and invoices to prove the original milage which is only 11.000 kms. The interior is also in extremely nice condition. The seats show light wear only, even on the driver`s seat bolster, an area that is typically worn in Ferraris. The remainder of the leather, which covers almost every surface, including the sills, door panels, dashboard, rear parcel shelf, and headliner, is excellent. The dashboard is done in a rich dark black leather that sets off the tan nicely and is almost completely free from the shrinkage and discoloration that frequently affects these cars. The carpets are very little worn out as the car shows only 11.000 km. The engine compartment and trunk are also in excellent conditions. This is a great opportunity to acquire one of these very neat and important cars. Their astonishing styling still carries tremendous impact, and they are modern in terms of driving, classic in terms of design, practical, and easy enough to drive to use on a regular basis. This car has been enthusiastically owned and well-maintained, both mechanically and cosmetically, and is in excellent condition, irrespective of mileage. It represents a great way to enjoy the Ferrari experience as often as possible for the new owner. Moreover, with values of these cars coming up.